Atmospheric River Event To Pound California Mon - Tue. La Niña Is Gone - El Niño To Return This Spring? 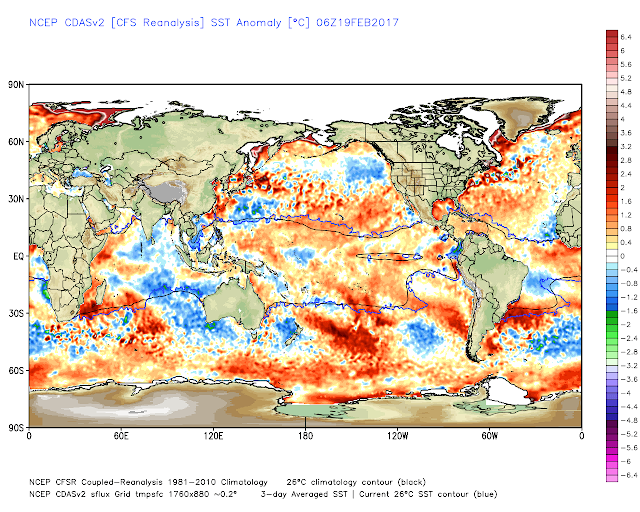 Latest Sea Surface Temperature Anomalies. 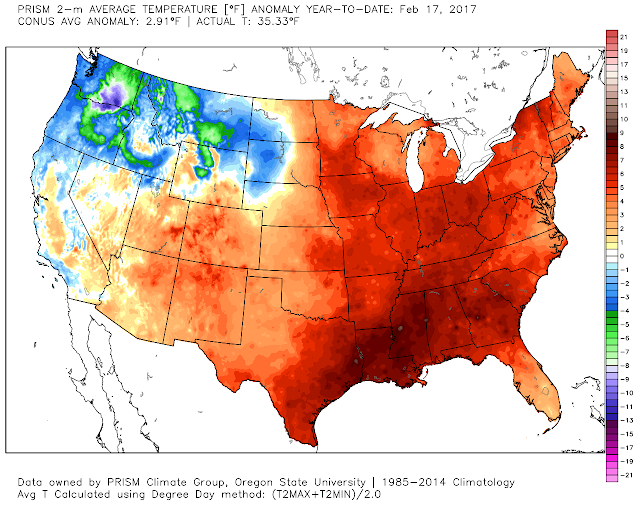 La Niña Is Gone - El Niño To Return This Spring? 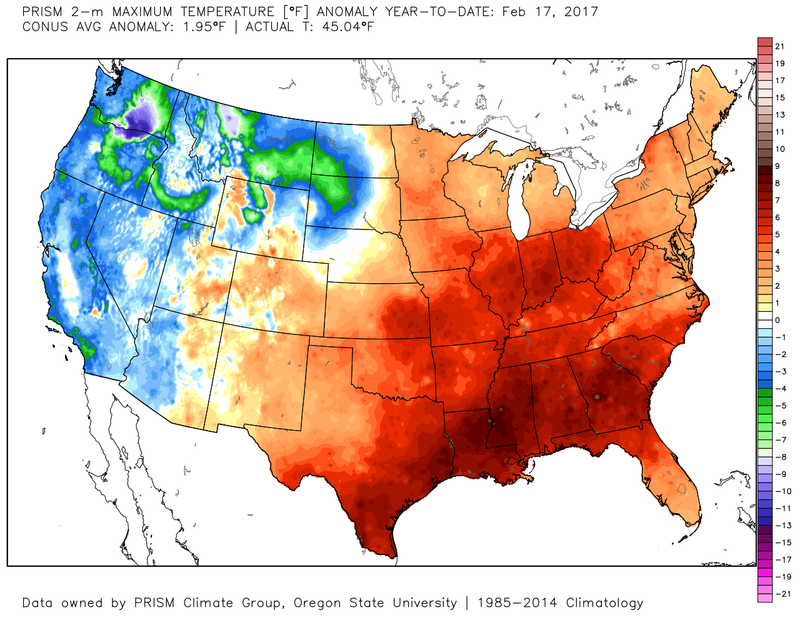 2017 Starting Off Warmer & Wetter Than Normal. 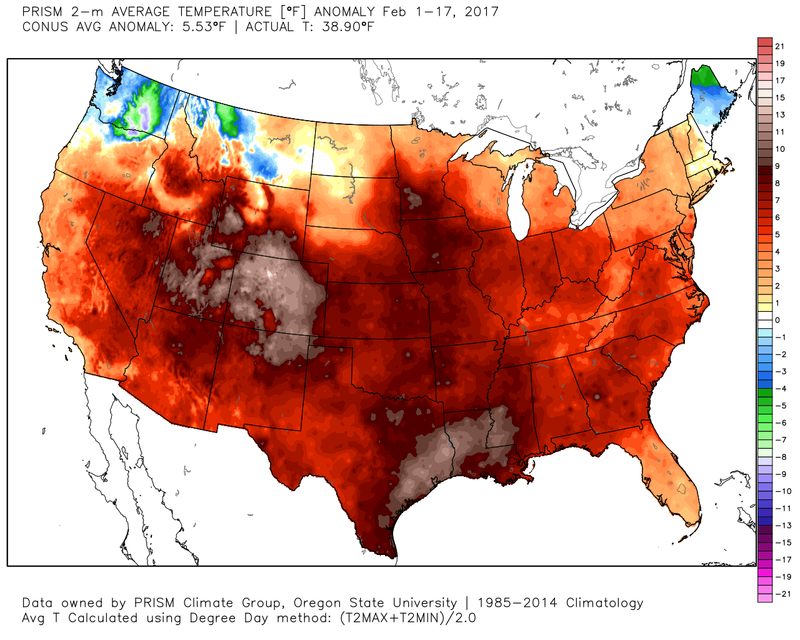 U.S. Year-To-Date Average Daily Temperature Anomaly. (January 1st - February 17th). 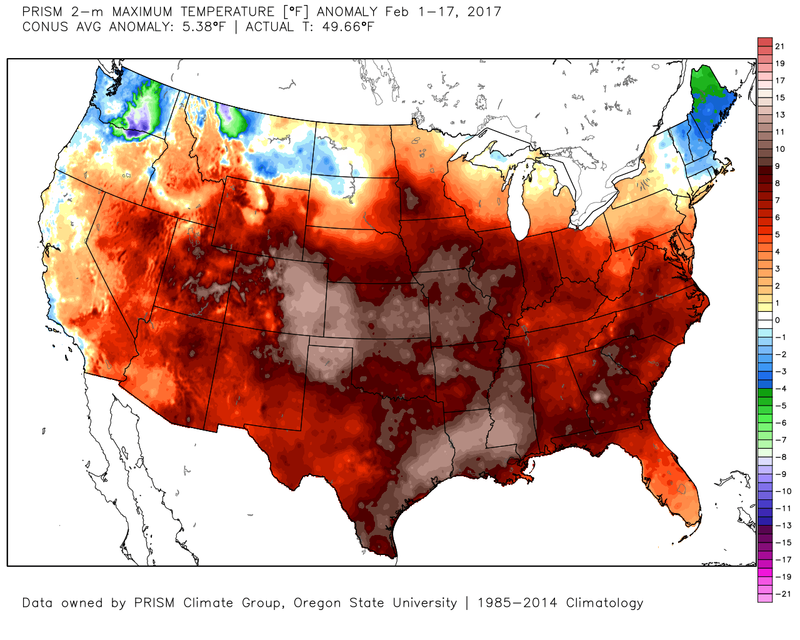 U.S. Year-To-Date Daily Average High Temperature Anomaly. U.S. Year-To-Date Daily Average Low Temperature Anomaly. 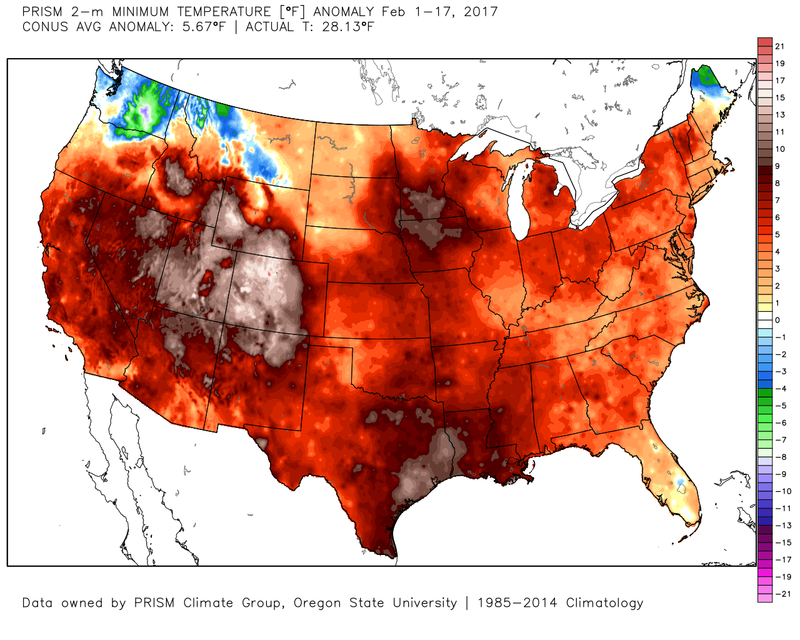 U.S. February Average Temperature Anomaly. (February 1st - February 17th). U.S. February Daily High Temperature Anomaly. U.S. February Daily Low Temperature Anomaly. (January 5th - February 17th). 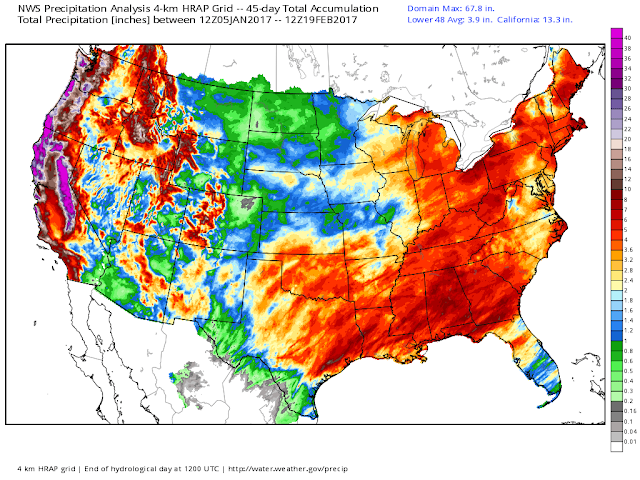 U.S. February 2017 Precipitation Totals. 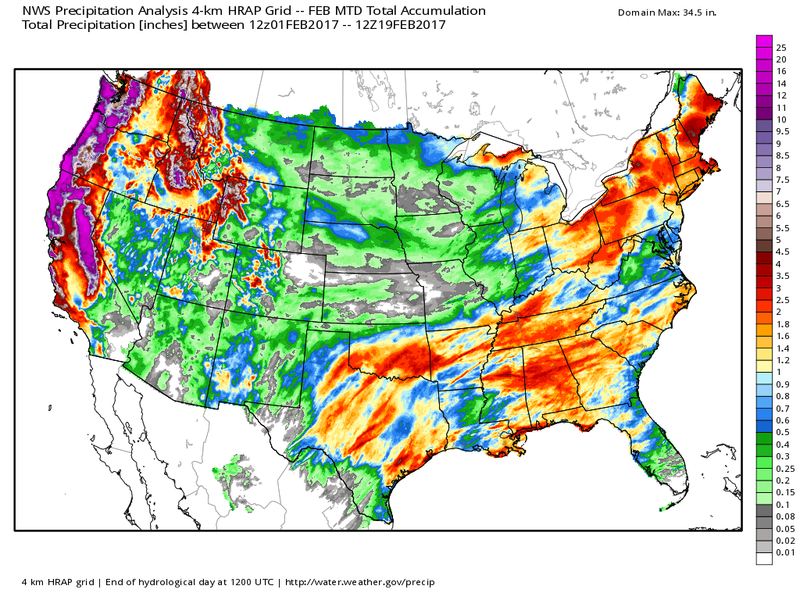 California 2017 Year-To-Date Precipitation Totals. California 2017 February Precipitation Totals. 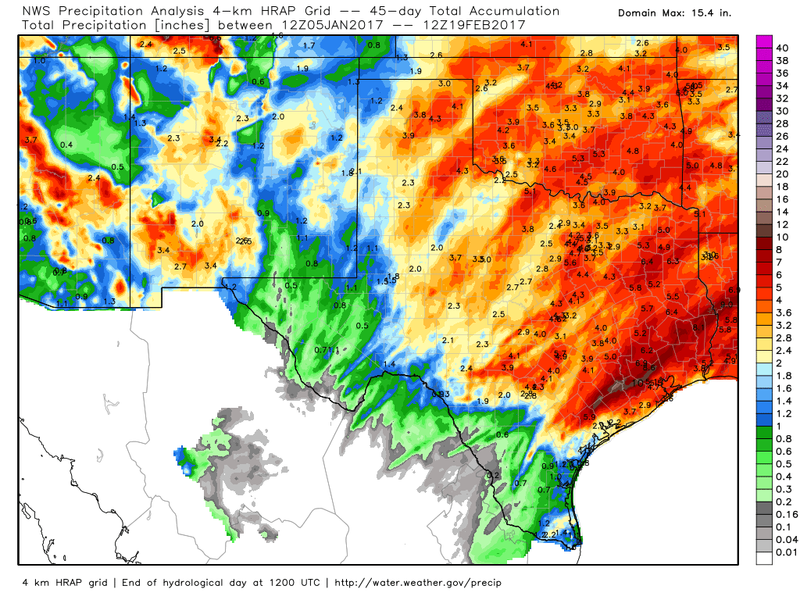 New Mexico & Texas 2017 Year-To-Date Precipitation Totals. New Mexico & Texas 2017 February Precipitation Totals. 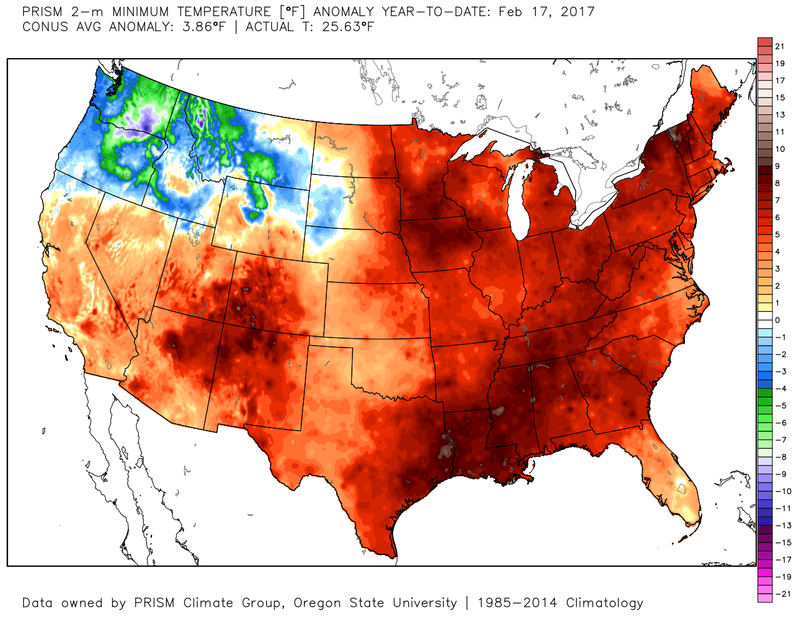 So far this year is starting out warmer to much warmer than normal across the nation. This can be in part be blamed for the above average sea surface temperatures in the Pacific Ocean, and the Gulf of Mexico. And to a somewhat lesser degree the Eastern Atlantic Ocean. La Niña conditions over the Pacific Ocean have dissipated leaving the Ocean in a near neutral condition. There are increasing signs that El Niño conditions will return later this spring or early this summer. The MJO has had a huge short term impact on this winter's temperatures and precipitation. Also playing a role in this winters pattern was the early and deep snowpack and cold across Northern Asia, which helped produce a strong jet stream that cooled the waters of the Central Pacific Ocean. So instead of Climate Change once again its the planet's natural cycling of the its Oceans (in this case the Warm PDO Phase) that has been a driving force in how this winter has turned out so far. 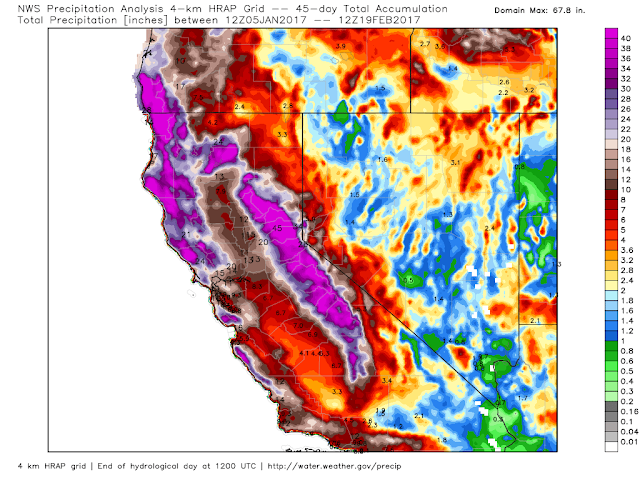 These factors have helped to form "The Atmospheric River Events" that have produced record to near record rainfall totals across California and parts of the Western U.S. this winter. Click on this link to view some of the more recent significant AR Events. 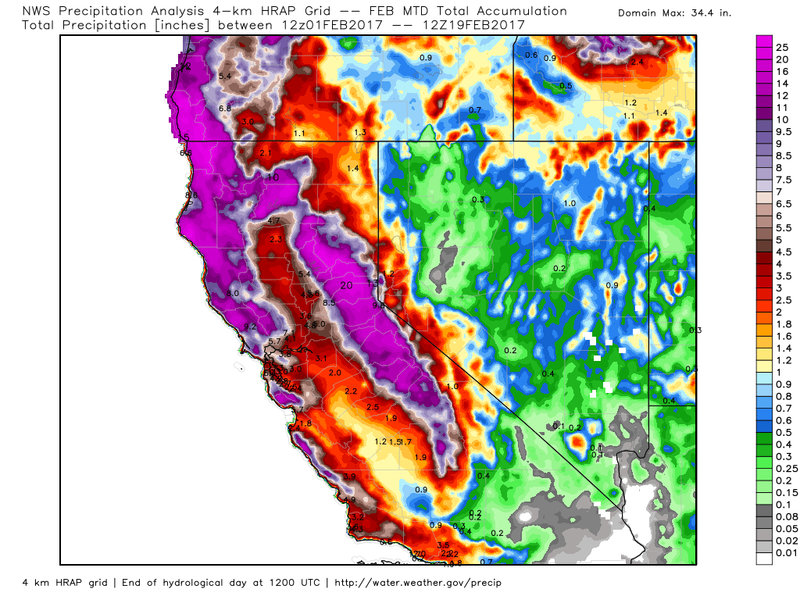 Sadly the worst of this winter's onslaught may yet to occur in California. 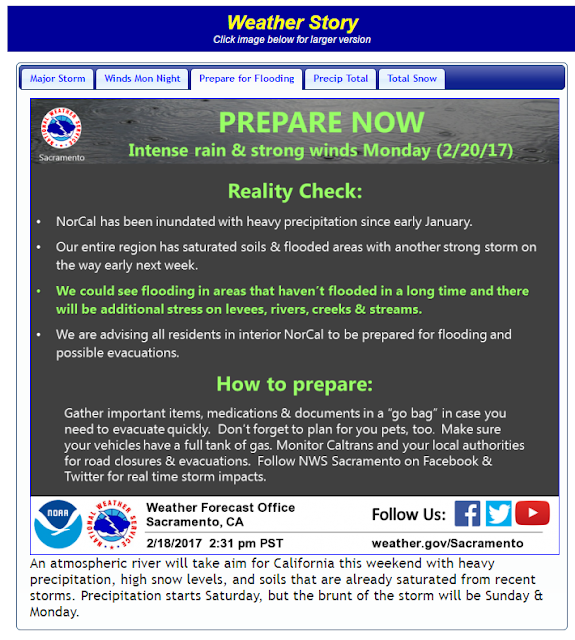 Long range computer forecast models and climatology suggest that yet more storms will line up and take aim at California and the Western U.S. as we transition out of winter and into spring. 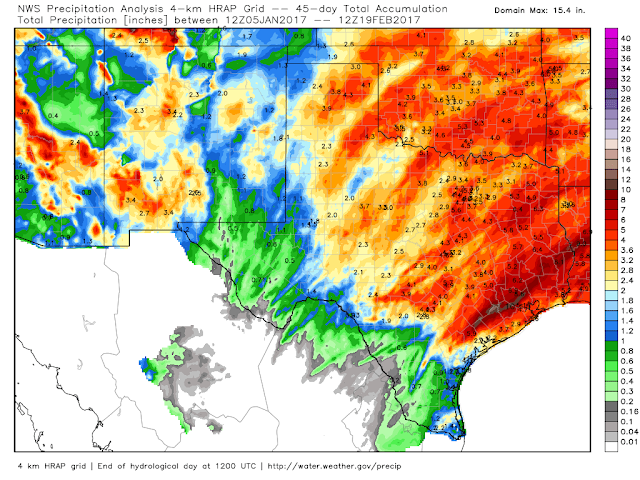 This will be bad news for them as temperatures warm and the record to near record snowpack in the mountains begin to melt and fill already swollen lakes, rivers, and creeks. More Heavy Rain & Snow For California Today Into Tuesday! 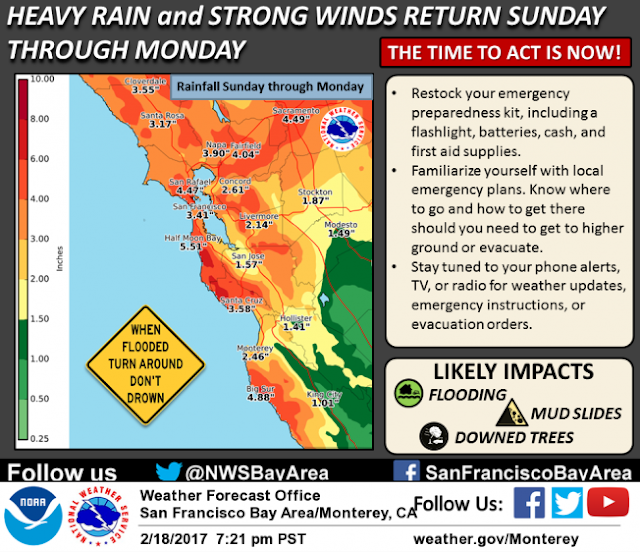 Courtesy Of NWS San Francisco. rainfall will then taper off late Monday night into Tuesday. especially along the coast and over higher peaks and ridges. atmospheric river (AR) with PWAT values forecast to exceed 1.35"
scar areas remain of great concern. 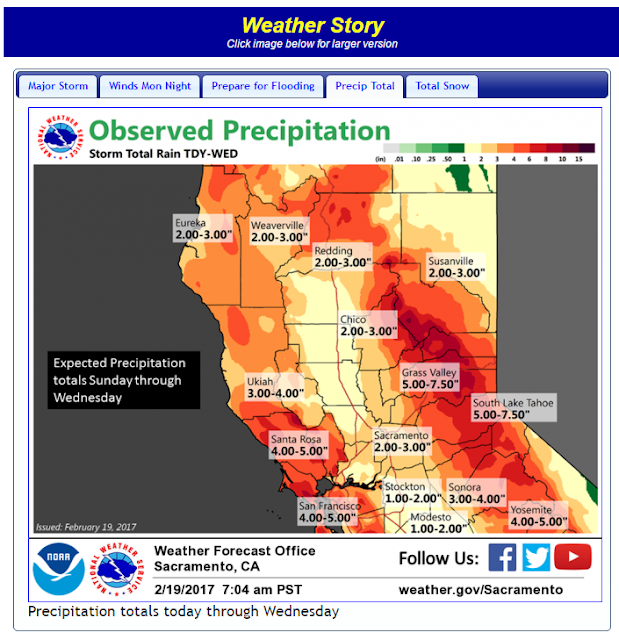 mid/upper level trough shifts inland across northern California. currently forecast from Tuesday into Wednesday. as forecast confidence remains low beyond early next week. thunderstorms possible Tuesday and Wednesday. winter storm warning through Tuesday evening. and foothill showers. Any precipitation is expected to be light. Why So Much Rain & Snow This Winter In California? Atmospheric Rivers (ARs) are relatively narrow regions in the atmosphere that are responsible for most of the horizontal transport of water vapor outside of the tropics. 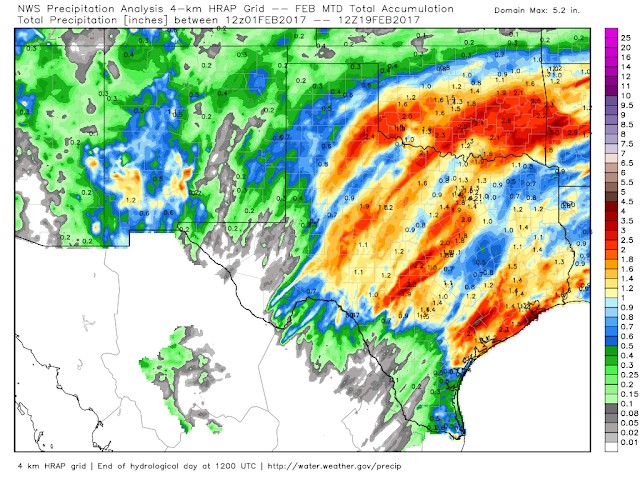 While ARs come in many shapes and sizes, those that contain the largest amounts of water vapor, the strongest winds, and stall over watersheds vulnerable to flooding, can create extreme rainfall and floods. These events can disrupt travel, induce mud slides, and cause catastrophic damage to life and property. However, not all ARs cause damage – most are weak, and simply provide beneficial rain or snow that is crucial to water supply. On average, about 30-50% of annual precipitation in the west coast states occurs in just a few AR events, thus contributing to water supply. 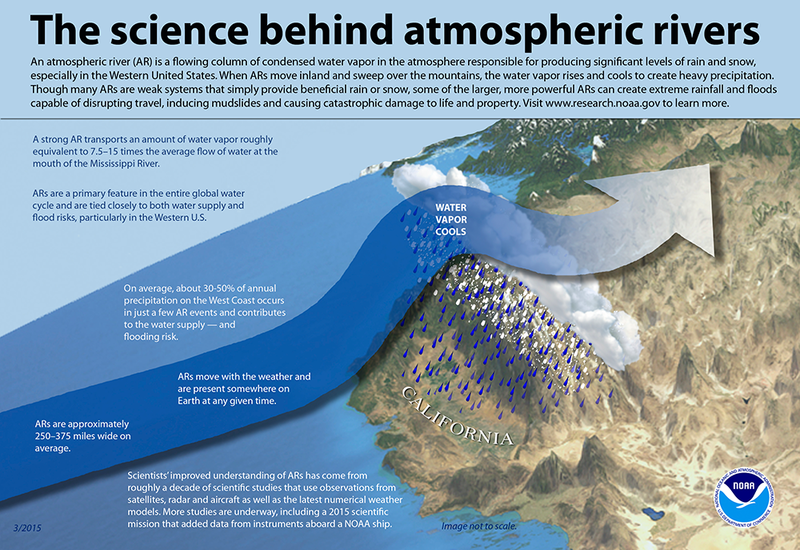 In the strongest cases ARs can create major flooding when they make land-fall and stall over an area.On average, about 30-50% of annual precipitation in the west coast states occurs in just a few AR events, thus contributing to water supply.In the strongest cases ARs can create major flooding when they make land-fall and stall over an area.ARs are a primary feature in the entire global water cycle, and are tied closely to both water supply and flood risks, particularly in the Western U.S.A well-known example of a type of strong AR that can hit the U.S. west coast is the "Pineapple Express," due to their apparent ability to bring moisture from the tropics near Hawaii to the U.S. west coast.A strong AR transports an amount of water vapor roughly equivalent to 7.5–15 times the average flow of liquid water at the mouth of the Mississippi River. ARs move with the weather and are present somewhere on the earth at any given time. What are atmospheric rivers, in more scientific terms? ARs are the water-vapor rich part of the broader warm conveyor belt (e.g., Browning, 1990; Carlson, 1991), that is found in extratropical cyclones ("storms"). They result from the action of winds associated with the storm drawing together moisture into a narrow region just ahead of the cold front where low-level winds can sometimes exceed hurricane strength. 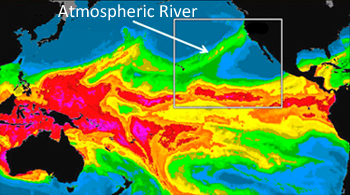 The term atmospheric river was coined in a seminal scientific paper published in 1998 by researchers Zhu and Newell at MIT (Zhu and Newell 1998). Because they found that most of the water vapor was transported in relatively narrow regions of the atmosphere (90% of the transport occurred typically in 4-5 long, narrow regions roughly 400 km wide), the term atmospheric river was used. A number of formal scientific papers have since been published building on this concept (see the publication list), and forecasters and climate researchers are beginning to apply the ideas and methods to their fields. The satellite images at left show strong ARs as seen by satellite. The advent of these specialized satellite observations have revealed ARs over the oceans and have revolutionized understanding of the global importance of ARs (more traditional satellite data available in the past could not clearly detect AR conditions). The interpretation of these satellite images, which represent only water vapor, not winds, was confirmed using NOAA research aircraft data over the Eastern Pacific Ocean and wind profilers along the coast (Ralph et al. 2004). The event shown in the bottom-left image was documented by Ralph et al. (2006), which concluded this AR produced roughly 10 inches of rain in 2 days and caused a flood on the Russian River of northern California. It was also shown that all floods on the Russian River in the 7-year period of study were associated with AR conditions. As of late 2010 there have been a number of papers published on major west coast storms where the presence and importance of AR conditions have been documented. These are provided in an informal list of the "Top Ten ARs" of the last several years on the U.S. West Coast. It is now recognized that the well-known "Pineapple express," storms (a term that has been used on the U.S. West Coast for many years) correspond to a subset of ARs, i.e., those that have a connection to the tropics near Hawaii. In some of the most extreme ARs, the water vapor transport is enhanced by the fact that they entrain (draw in) water vapor directly from the tropics (e.g., Bao et al 2006, Ralph et al. 2011).